With offices in San Francisco and Palo Alto, we are well situated to head North or South, offering coverage of the top towns on the Peninsula. Please email info@systemacs.com and include your phone number and desired time to hear from us. We will reply within one business day. *We are located just two blocks from the Apple Store and can avoid the scheduling challenges of on-site service. If your system requires hardware service, we can coordinate your repair with the Apple Store and provide preferential treatment. If your system is to be repaired, we offer a Loaner Program to make sure you have a working computer to use while yours is repaired. This program is a unique service for systeMacs clients. Call to make an appointment. 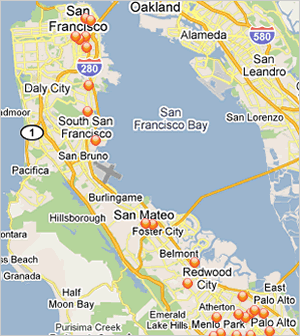 We have clients in San Francisco and most major cities down the peninsula, as far south as Mountain View. We’d love to add you to our client map. systeMacs provides professional and affordable Mac OSX computer support to businesses in central San Francisco and Northwest San Francisco and the following South Bay areas: Atherton; Belmont; Cupertino; Foster City; Hillsborough; Los Altos; Menlo Park; Palo Alto; Portola Valley; Redwood City; San Carlos; San Jose; San Mateo; Santa Clara; Sunnyvale and Woodside. Hardware images courtesy of Apple Computer, Inc.